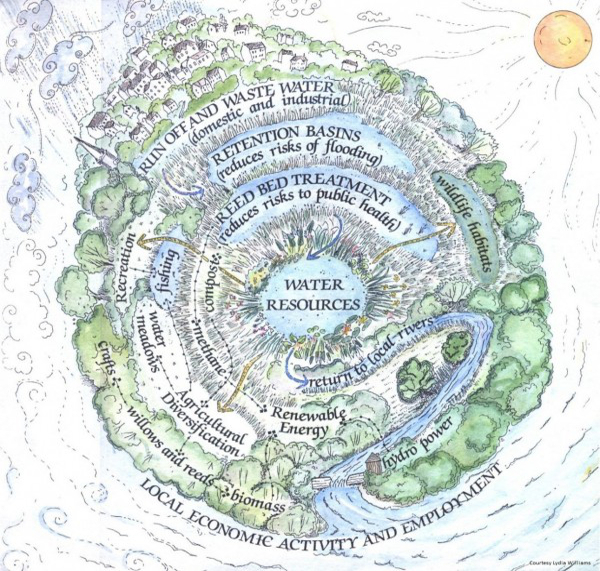 A landmark article about sustainable water treatment, written by Julian Jones of Water21 for Resurgence magazine 20 years ago (issue 169, pp. 43–5, 1994). Julian Jones co-presented, produced, and co-funded the BBC programme Don’t Go Near the Water with the late Kirsty MacColl in 1991, and built a reed-bed for the purpose. Reed-bed treatment of sewage water is the vanguard of an ecologically sustainable lifestyle. “MAKING WATER WORK” was a slogan used to promote the privatization of the water industry in England and Wales. The whole process caused great public unease then and five years on, there are serious doubts whether this monolithic industry is indeed “working”. If competition is now allowed with telephones, electricity and shortly gas, why not sewerage and water? There is actually no engineering reason to prevent this and there are many economic and health reasons that would encourage it, with some urgency. Who would be best placed to compete? 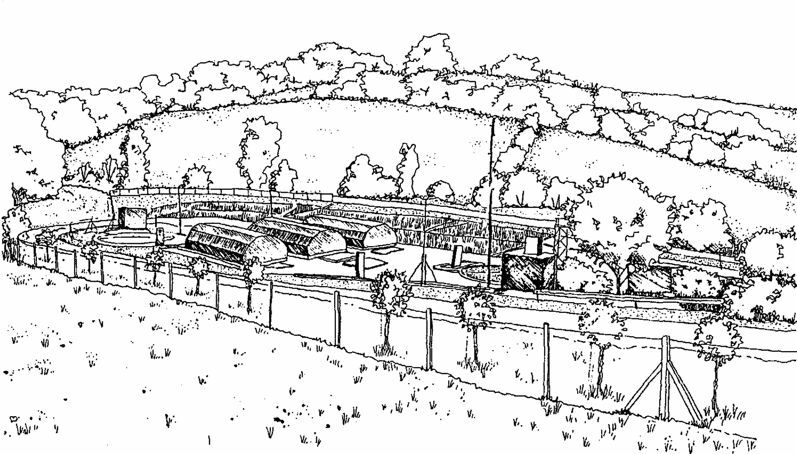 The term “sewage farm” arose from the old practice of grass-plot treatment of sewage on farmland: a method largely discontinued as chemical process engineers took over the treatment of sewage, at a price that is turning out to be too high. Our chemical industry has tampered for too long with our natural hydrological and nitrogen cycles, providing much of the technology for the water industry and also cornering the business of farm fertilization. A neat trick—we pay massive subsidies to our farmers to apply artificial fertilizers to their fields and then have to pay again to remove the resulting harmful levels of nitrates from our drinking water, whilst also paying over the odds to have our own natural fertilizer disposed of! We might ask the question whether our water utilities, in perpetuating this economic folly, are really protecting customers’ interests – in the Courts if needs be, but try OFWAT first. The Office of Water Services is one of the key economic regulators of the water industry, charged with protecting customers’ interests. In reality they are not able properly to provide this function as they can only police the outdated principles enshrined in the Water Acts. This industry is in effect unregulated. Hoechst High Chem (journal of one of Europe’s largest chemical companies) explained in December 1992, “Only now is modern science unravelling step by step the mysteries of water’s global circulation and its many consequences for life on Earth.” A disturbing admission from the men in white coats, in whom we had placed so much faith. As if we should have known all along, Nature is the finest water engineer. In terms of cost/benefit analysis this can be proven now through the development of reed-bed treatment, or constructed wetlands, a form of super-efficient grass-plot whose construction costs are typically 50% of conventional sewage treatment costs, with running costs of only 10%. Even this is only part of the picture—there are secondary benefits that make the case for such natural water management overwhelming. SLOW MOVES TOWARDS wetland usage are coming from “the authorities”. The Department of the Environment does now approve reed-beds for sewage at remote communities. It has thus taken time for reed-beds to be accepted by the mainstream. The most outstanding work is that of Andrew Joiner, at Iris Water & Design—his 500 persons system at The Trossachs, Scotland, is quite stunning; treating whole macerated sewage to near “zero-pollution” standards. The water companies themselves are also making some progress. Severn Trent Water has over eighty reed-beds working well now, albeit rather crude and primitive by comparison with the Iris System. According to The Wildfowl & Wetland Trust, Slimbridge, at one time half of the UK land area comprised wetlands; the total is now less than 2%, largely due to agricultural drainage. It was central government that encouraged this and it is the agricultural community that should now be restoring wetlands. They are nature’s kidneys for cleansing water (and grants are available for this, for conservation uses. Only statutory water companies have access to government and EC grants for sewage treatment systems, at present). They also fulfil a wide range of other vital functions: flood relief; water resource storage (a useful counter to endless cycles of drought and flood); release of secondary resources for fertilization; reeds, rushes and willow for biomass and other uses; conservation and leisure activities, fishing, and so on. Reed-bed treatment (RBT) of sewage water actually appears to be the vanguard of a sustainable lifestyle for our society; the thin end of a very thick Green wedge of alternatives—maybe the “Holy Grail” for organic farming and the start of the thread with which we can darn our frayed biosphere. IF WE SHOULD NOW be getting excited at being placed at the entrance of some utopian Shangri-La, then of course caution must be urged, as we have patently been thrown out of the Garden of Eden! And like a veil slowly being lifted, the answers are being revealed. While there are magical elements to working with the environment, the bottom line here is that communities must find their own vision and energy to bring about positive change, actually taking on responsibility for this. Public care for the environment is the greatest engine for change now. Summer 1994—we have the spectacle of water-rate payers burning their water bills on the streets of South West England, due not just to ever increasing charges but also heightening environmental awareness. Do you care enough to query your water bill and the methods behind the ever increasing costs? Being able to justify your bill is the first “law” for any supplier in any free market. If a loaf of bread costs too much, or is not so tasty in one shop, you go to another. So take the “Thatcherite” route, query it in the courts (the judiciary have to drink water too) and organize. Reed-beds blow great holes in sewerage monopolies—how about one for a run-down city centre? Derelict land is fine. 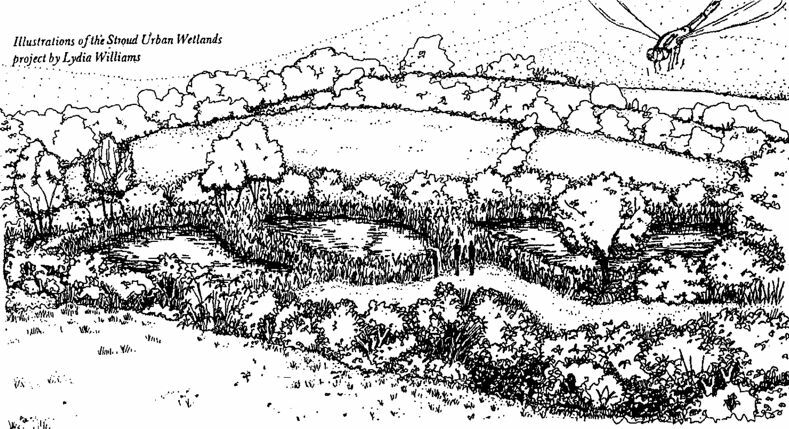 Have a costed reed-bed alternative lined up, through either a farmer or a Local Water Trust, or maybe a Council or even a trading company (or any combination of these). The principle of BATNEEC (“Best Available Technology Not Entailing Excessive Cost”) can be applied through the use of reed-beds as an alternative in most situations. Rural sites are easiest and because of an anomaly in UK water charges, water rates here are higher than in towns! So come on, Devon and Cornwall, get off the streets and into the courts. It will most likely take only one town to “break free”, to start a domino effect. The reality is that the plans for the privatization of UK water were drawn up based on unsustainable and out-dated concepts dating back to the Victorian Era. The world is changing fast and while environmentalist concern may have been a minority interest a decade ago, it could be conjectured that it is now water industry attitudes that comprise the minority extremist approach. Many of us want spring water and organic food now. FARM FERTILIZATION with sewage is potentially problematic—various aspects of the direct return of human waste to our food chain warrant concern, though mainly can be overcome (return to forestry is best). The commonest problem is the accumulation of heavy metals in the sludge. These are derived from industrial waste, which a centralized sewerage system conveniently dilutes and neutralizes with the domestic sewage (domestic consumers are thus effectively subsidizing industry—that won’t do in a free market). Reed-beds again benefit here by allowing in situ treatment to decentralize the system, allowing segregation of the two waste types. One industry’s waste can be another’s raw material. Localized waste-water treatment cuts pumping and trunk sewer costs, returning water straight back to rivers rather than short-circuiting the hydrological cycle, as is often the case presently. This opens up the potential for small-scale farm freshwater storage (water farming) which is cheaper and environmentally preferable to grandiose reservoir or cross-catchment water transfer schemes. Decentralization of either water or sewage further reduces costs by doing away with many miles of trunk sewers/mains and pumping stations—saving energy. Decentralization of sewerage is perhaps most crucial now for reasons of public health, where a continuing evolution of understanding of the risks here is taking place. It is for only a few years that we have appreciated the long life of sewage viruses in the sea—upwards of a year. Despite the extensive catalogue of accepted potential risks to health from direct contact with sewage, successive UK governments have allowed the practice of discharging raw or simply macerated sewage into the sea. The level of risk here was previously based on a 1959 study, by the UK Public Health Laboratory Service, which concluded that “bathing in sewage polluted sea water carries only a negligible risk to health”. A further study (Moore, 1974) found that “microbial standards for bathing water are irrelevant to the public health”. These two hopelessly flawed studies have been the basis of water-industry attitudes that have allowed raw sewage discharges into the sea and, more recently, into freshwater. Two other factors allowed this situation—the past lack of public interest in these matters and also the erroneous belief in government that high costs were involved in rectifying shortfalls. All three of the key determinants of aquatic modus operandi are now themselves radically altered, since being enshrined in the Water Acts. For those contemplating legal action over their bills, The Supply of Goods and Services Act may actually now be the relevant legislation in the light of the reed-bed alternative (i.e. you really do have a choice) and far more favourable to the consumer. When we apply the new knowledge or health risks to the situation on UK rivers at present we should be alarmed. There are some 30,000 storm overflows and these are usually consented to flow at times other than during storms—when sewers (frequently) collapse or block up for example. Without the dilution and cleansing action of rainwater these wastes can build up, posing a direct risk. Vast monolithic centralized water and sewerage systems, thought of since the Victorian Era as the epitome of good sanitary practice, can now be revealed as a threat to public health and wealth. They short-circuit natural hydrological cycles, sucking rivers dry and often dangerously discharging pathogenic raw sewage as they progressively collapse. Present investment programmes only provide to patch these up. “Small is beautiful”, and healthier, and cheaper. A further variant of reed-bed design can cheaply and safely “strain” storm overflow waste—and farmers would be best to maintain and probably own this. WATER INDUSTRY REASONS for not fully using reed-beds have ranged from “not enough space” to “third world technology”—completely spurious. As Severn Trent put it after a recent visit from an Eastern European delegation, reed-beds are “cheap, simple and effective—ideal for Poland”. So why not in the UK? Mainly because of the perpetuation of the myth that sewerage infrastructure needs to be so expensive, and as water industry profits are calculated as a percentage of costs, the higher the better. After years of telling the public that charges are having to go up, who might say actually they could be halved? Farmers could—they have the land to spare (even in urban fringe areas around cities) and the skills and sensitivity for what is after all a (water) gardening job. The Water Acts do allow for competition in certain circumstances. At present levels of sewerage charges a reed-bed would return up to £25,000 pa/ha income for a farmer (it certainly beats set-aside) and no doubt there would be some room here for negotiation. Some Planning Authorities already allow for RBT. Stroud, in Gloucestershire, with its past bitter public health problems notes in its new District Structure Plan that there should be adequate sewerage and that new housing “development does not harm human health.” Detailing this further “that there is the potential for the treatment of sewage by environmentally sensitive means, such as through the use of reed beds.” And already around Stroud, with its notably Green population, there are at least six working reed-beds now, defining a higher standard for all river discharges in the locality. If we get the environment we deserve, then aquatic considerations (as the planetary life-blood) will be at the forefront of any changes in perceptions. It is as if public awareness is awakening from a long slumber—perhaps the two centuries since William Blake predicted that “All the Arts of Life . . .” would become “the Arts of Death in Albion”, owing to our blindness to “the simple rules of life”. It was the Victorian Era that heralded the “flush it and forget it” mentality and the engineering for this, which seemed to work during this period of reduced consciousness—we now know otherwise. Perhaps reed-beds are just too simple, though they do need a professional approach for success. The saving grace of the whole water privatization process is this much vaunted (though still rarely properly applied) aspect of “market forces”—who actually decides these? Is it mysterious figures in the City? No, it is we the “public”—we are the arbiters of the marketplace, through our purchasing decisions. As detailed above, there can now be a choice with sewerage. It is up to each of us to “act locally” and be responsible, maybe demand, to look after water after we have made use of it.